Addington Brass and the Christchurch Youth Choir are in the final rehearsals in preparation for the annual fundraising concert for the Christchurch City Mission. This year the concert will be performed on at the Transitional Cathedral in Latimer Square on Saturday evening at 7.30pm. City Missioner, Michael Gorman, said the band and choir have been rehearsing for months in preparation for this fundraiser which is programmed to bring a festive feel by the performance of Christmas carols and sacred pieces from the popular ‘O Come all Ye Faithful’, ‘Hark the Herald’, and beautiful ‘O Holy Night’ to the very entertaining ‘Frosty the Snowman’ and many others. This year’s concert will be enhanced by featured trumpet soloist, Colin Clark. Originally from Australia Colin now resides in Auckland. Colin has served with both the NZ Army Band and Royal New Zealand Navy Band, as well as playing in local Woolston Brass Band. Four times Australian Junior Brass Champion of Champions, and winner of numerous state and national solo championships on both sides of the Tasman, Colin has represented both Australia and New Zealand in National Brass Bands and will be featured playing a selection of classic and modern favorites. 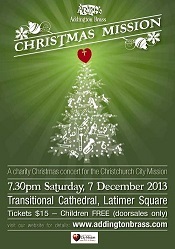 Ticket price $15 with all profits going directly to the ‘Christchurch city Mission’.